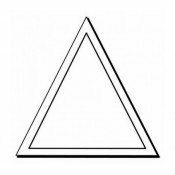 Custom triangle shaped magnets offer a fresh deviation from rectangular, square or circle magnets and they are perfect to triangulate your business or personal messages. 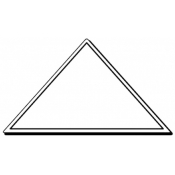 Many people cannot hide their amusement and excitement on being complimented with these custom triangular magnets bearing an overpowering shape. 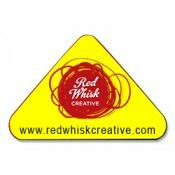 It is sure that your customers will not dare to forget your brand information, when imprinted over these magnets. 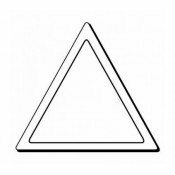 Order more to save huge on these triangle refrigerator magnets. Perfect for mass gifting! 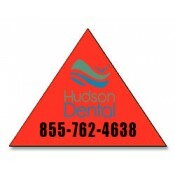 Promotional triangular shaped magnets are sure to become a fixture in the lives of your customers because they are sure to stick it to their refrigerator doors or other visible surfaces within home. 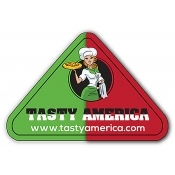 These customized magnets will help them to memorize your brand name, website address, telephone number, franchises, or hours of operation. 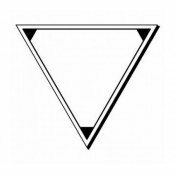 Being produced from high quality vinyl material, you can expect these custom triangle fridge magnets to last longer, than your usual business card, pamphlet, flyer, or notepad. You can stay assured that this custom magnet is lead-free, because it is 100% made in USA using high quality magnetic materials. By investing in these triangular shaped magnets, you are not only eyeing to leave a deep impact on minds of customers, but also inspiring them to become vocal advocates of your business. 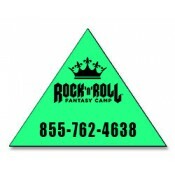 You can grab appealing discounts by bulk ordering these custom triangle magnets and expect high ROI. 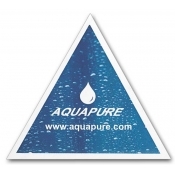 At custommagnetsdirect.com, we offer benefit of full color imprinting, free art setup, free shipping and free online design proof to customers, who decide to buy from us. Feel free to contact us at 855-762-4638 or mail at info@Cmagnets.com.